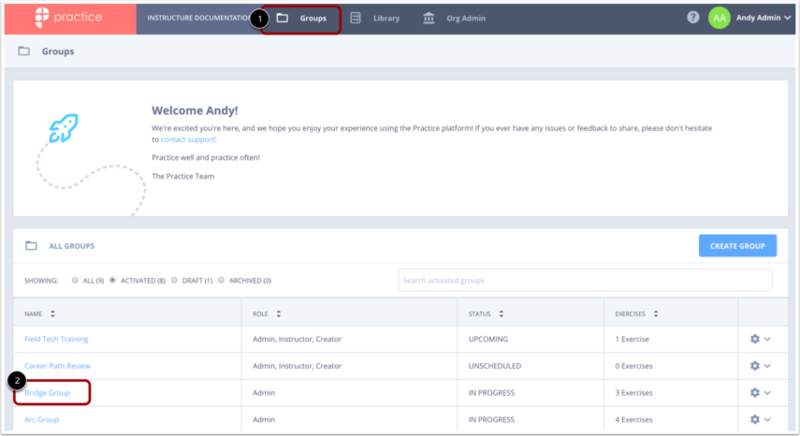 To configure your Exercise, go to your Groups page by clicking the Groups link  from the top navigation bar. Select the Group  that has the Exercise you want to configure. On the Group Details page, click the Edit Group button. Select Exercises from the panel on the left hand side of the page. 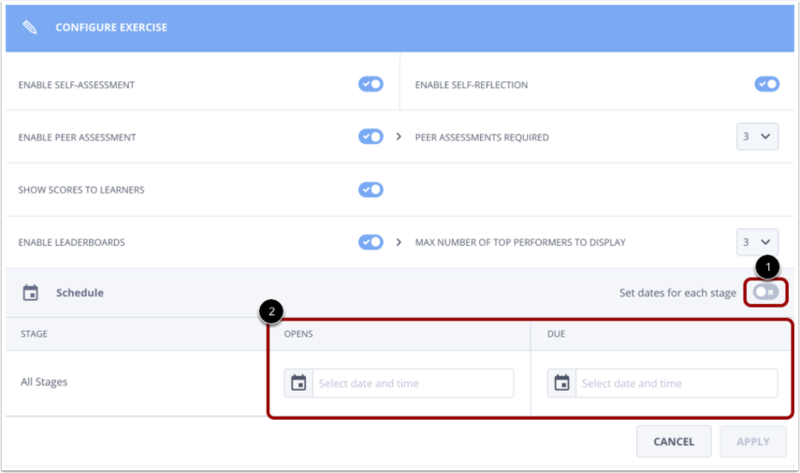 If you have not scheduled the Exercise before you can find the Exercise you want to configure under Unscheduled Exercises. Select the blue Configure Exercise button. 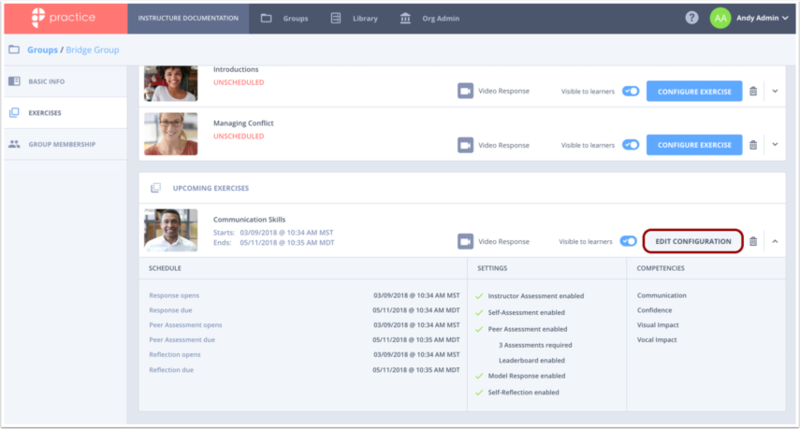 You can configure the settings for the exercise name , learner response type , instructor assessment , model response , self assessment , self reflection , peer assessment , score visibility , and leaderboard . 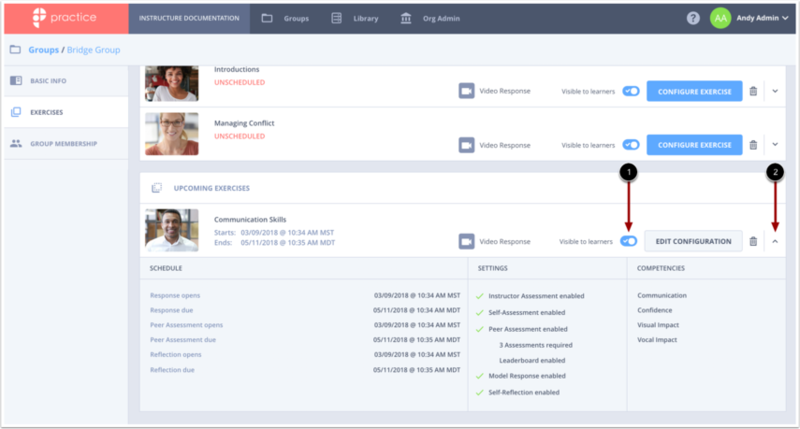 If you switch the Peer Assessment option on, you can set how many peer assessments each learner needs to complete in order to unlock the next learning stage. If you switch the Leaderboard option on, you can set the number of top performers the leaderboard displays. The leaderboard is a list of the top performers in the exercise, populated by learners' average peer assessment scores. Unscored exercises do not have leaderboards. 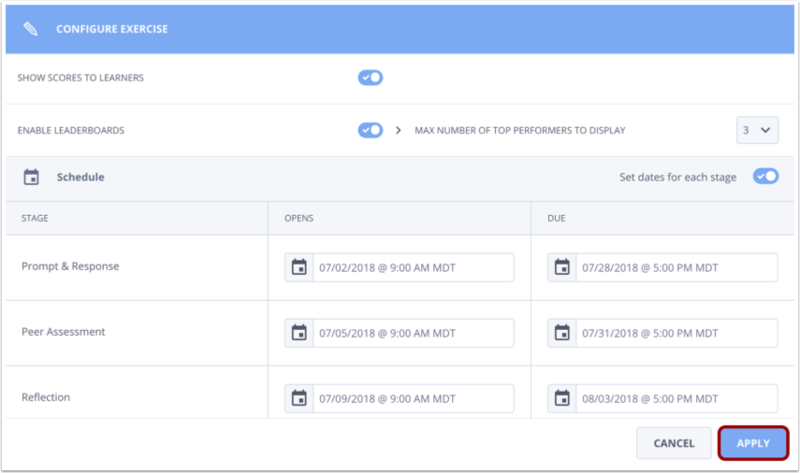 To set dates for each of the three stages, add dates to the Opens and Due date fields. Stages can be set to open and close at sequentially or concurrently. Learn more about the different scheduling options. To set one date for all three stages, click the Set dates for each stage toggle off . 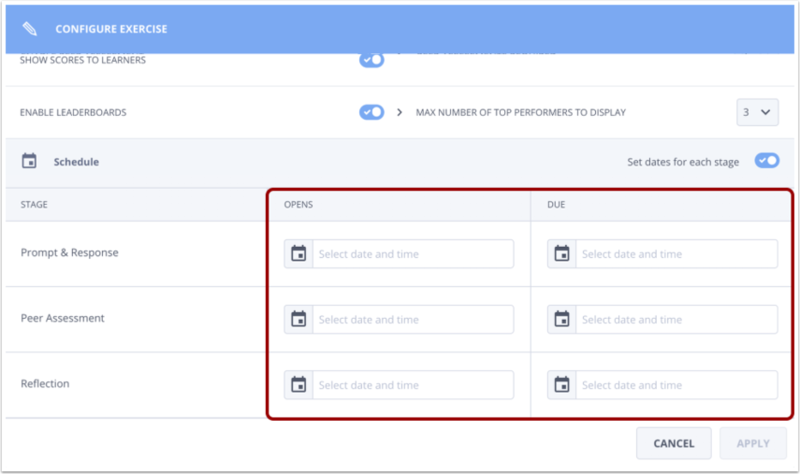 Then add dates in the Opens and Due date fields . After you are satisfied with the configuration and schedule of your Exercise, select the blue Apply button to save your Exercise. Once you configure your Exercise it is automatically made visible to Learners . To see the configuration and schedule you just set, select the gray arrow . To edit the configuration of an Exercise, select the gray Edit Configuration button. Previous Topic:How do I copy my content module in Practice? Next Topic:How do I delete my content module in Practice? Table of Contents > Exercises and Content Modules > How do I configure my exercise in Practice? 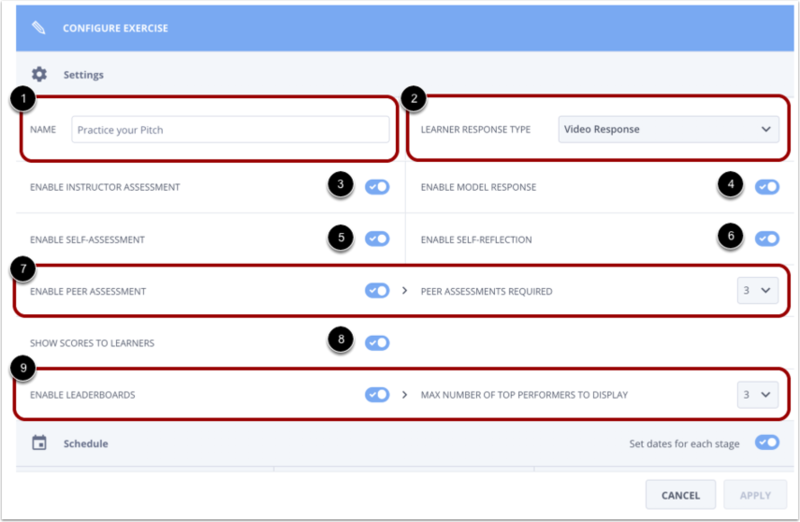 How do I create an LTI exercise template in Practice? How do I add an exercise to my group in Practice? How do I copy my content module in Practice?